IEEE Transactions on Smart Grid, vol. 8, issue 5, IEEE, pp. 2452 - 2459, 02/2017. (I.F. : 7.364)More..
One benefit postulated for the adoption of Electric Vehicles (EVs) is their ability to act as stabilizing entities in smart grids through bi-directional charging, allowing local or global smoothing of peaks and imbalances. This benefit, however, hinges indirectly on the reliability and security of the power flows thus achieved. 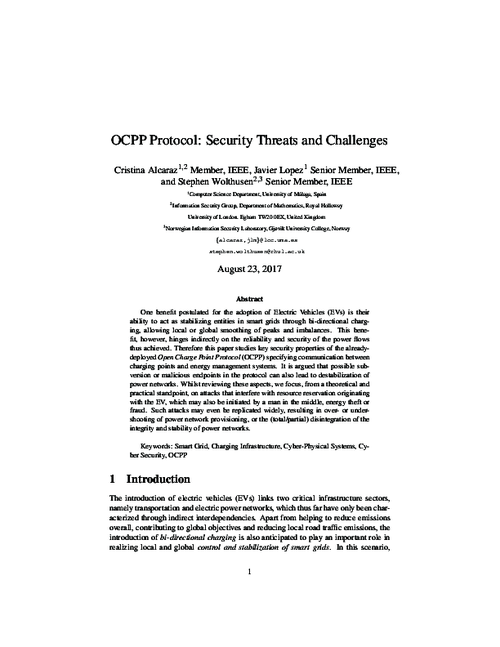 Therefore this paper studies key security properties of the alreadydeployed Open Charge Point Protocol (OCPP) specifying communication between charging points and energy management systems. It is argued that possible subversion or malicious endpoints in the protocol can also lead to destabilization of power networks. Whilst reviewing these aspects, we focus, from a theoretical and practical standpoint, on attacks that interfere with resource reservation originating with the EV, which may also be initiated by a man in the middle, energy theft or fraud. Such attacks may even be replicated widely, resulting in over- or undershooting of power network provisioning, or the (total/partial) disintegration of the integrity and stability of power networks.